The real issue is not China but the diverging of the current and expected paths of monetary policy among the major advanced economies, particularly the United States and Europe. The Fed has been tightening and is expected to continue do so with further rate hikes in 2017. The ECB, on the other hand, is still running its QE program and is keeping it short-term policy rates pegged close to zero. This policy divergence can be seen in the figure below. 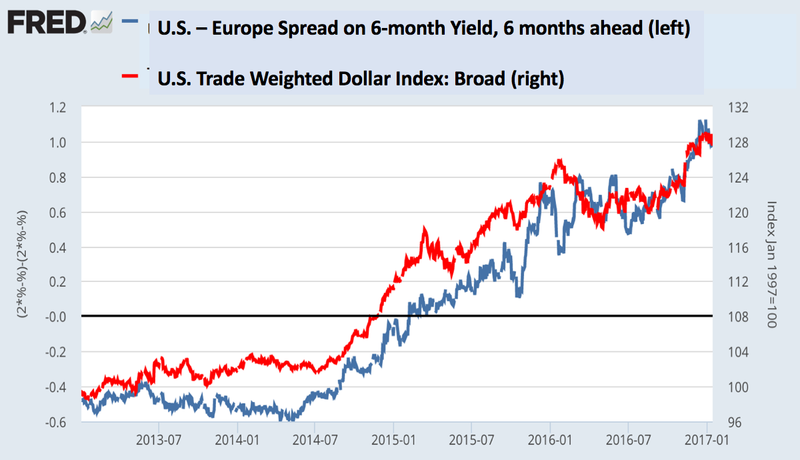 It shows the 6-month interest rate, 6 months ahead for the United States minus the same measure for the Eurozone (blue line).1 Ever since mid-2014 this spread has been rising--with a brief plateauing in 2016--and the trade weighted dollar (red line) has closely followed it. Part of the divergence between the expected paths of monetary policy comes from the belief that Trump's policies will spur robust growth. This belief may prove premature, but if it does come to fruition it will only reinforce the policy divergence by pushing interest rates higher. Going after China will not change this policy divergence. The surging dollar, if anything, creates more problems for the rest of the world than for the U.S. economy. It is something to worry about, as I have noted before, because there is a lot of foreign debt denominated in dollars and because other currencies tied to the dollar will also strengthen. But this is a very different problem than the one President Trump sees with the strong dollar. 1 I calculate this 6 month interest rate, 6 months ahead as follows. 1-year ratet = (6-month ratet +6-month rateet+1 )/2 + term premiumt (1). 2 x 1-year ratet - 6-month ratet = 6-month rateet+1 + 2 x term premiumt (2). (6-month rateet+1,USA +2x term premiumt,USA) - (6-month rateet+1,EUR +2x term premiumt,EUR) (4). 6-month rateet+1,USA - 6-month rateet+1,EUR = expected policy divergence (5) .